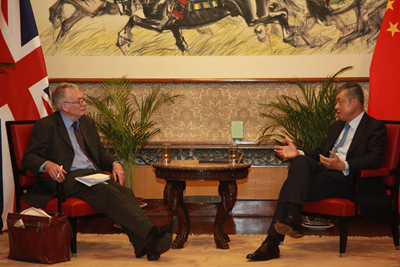 On June 20, Ambassador Liu Xiaoming met with David Marsh, Managing Director of the Official Monetary and Financial Institutions Forum of the UK (OMFIF). Senior managers from Soros Fund Management, Hermes Investment Management, Standard Chartered Bank and other companies were present. Marsh said that in recent years, China has made steady progress in economic growth and RMB internationalization, making important contribution to the balanced and diversified development of the world economy. The Belt and Road Initiative provides tremendous business opportunities for international investors in areas such as infrastructure, legal service and finance. The OMFIF is ready to play a positive role in relevant areas and intends to further expand exchanges and cooperation with China by way of holding themed roundtables. Ambassador Liu briefed them on China's economic and financial situation and spoke highly of the role played by the OMFIF as a bridge in promoting cooperation between China and the international financial community. He also noted that there exists a strong momentum for cooperation in economy and trade, finance, investment, energy and other fields, and China and the UK enjoy bright prospects for building the Belt and Road. 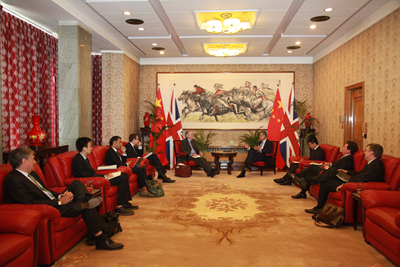 He hoped that people from investment and financial circles could build up confidence in China's economy and China-UK relations, tap into the potential for trilateral cooperation in a third country, and work together to contribute more wisdom and fruits to the "Golden Era" of China-UK relations. The Official Monetary and Financial Institutions Forum, founded in 2010 and headquartered in London, is an organization that provides policy advice for central banks, foreign exchange reserve authorities and sovereign wealth funds.